Fertilizers have been used to provide nutrients to soils, due some of them are too poor to grow. That substances were generally made in form of salts or easily soluble in water to enrich the soil. The application of the fertilizers substances in sowing, will help for the adequate growth of plants, trees, meadows and shrubs. The fertilizers are injected into the irrigation systems. In order to guaranteed the perfect dosage and effect in application, they should acquire a good mixture or solution in water. To achieve an effective fertilizer mix should be used a quality tank mixer. Pulsair, offers the best fertilizer mixer machine, to achieve the optimum organic fertilizer mix. The Pulsair’s 55 gallon drum mixer is the best solution to homogenize fertilizers that were separated out. 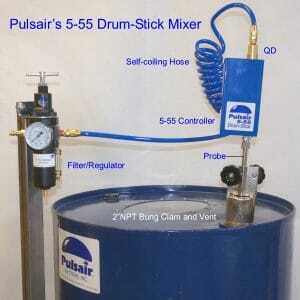 The Pulsair 55-gallon drum mixer works by pulsing in large bursts of compressed air or inert gas through a stainless steel probe in the bottom of the drum. Therefore the drum mixer can operate at any liquid level and also it is and excellent for reblending separated liquids or re-suspending settled solids in a matter of minutes. Non-shear mixing process mixes high viscosity liquids and liquids with high percentage of solids. [grid_right]“Since we started using Pulsair, our production and bottling process have greatly improved,” said Mitch Davis, founder of Mission Fertilizer. “Due to the nature of our all-organic liquid fertilizers, they tend to separate out and we needed non-shear mixing to keep the fertilizer homogenous. The lightweight Pulsair 10-55 Tote-Stick mixer is a perfect solution for us. As a quality control measure, we have incorporated the Pulsair mixing technology in our retail bottling process to reblend our tanks and keep solids in suspension and uniform. The Pulsair tote mixer has helped us save time and made life easier in the warehouse. The mixer is simple and easy to use and helps us keep solids from accumulating in the tank corners and allows us to mix at any liquid level. Anyone who is still using recirculating pumps or heavy mechanical tote mixers should really consider Pulsair”.